Autopolis new course record holder Tomoki Nojiri was the pole sitter for Round 5. He got off to a slow start to the race. 5th grid starter Pierre Gasly, who had on soft tires, had a solid start, helping him to jump into 2nd place. 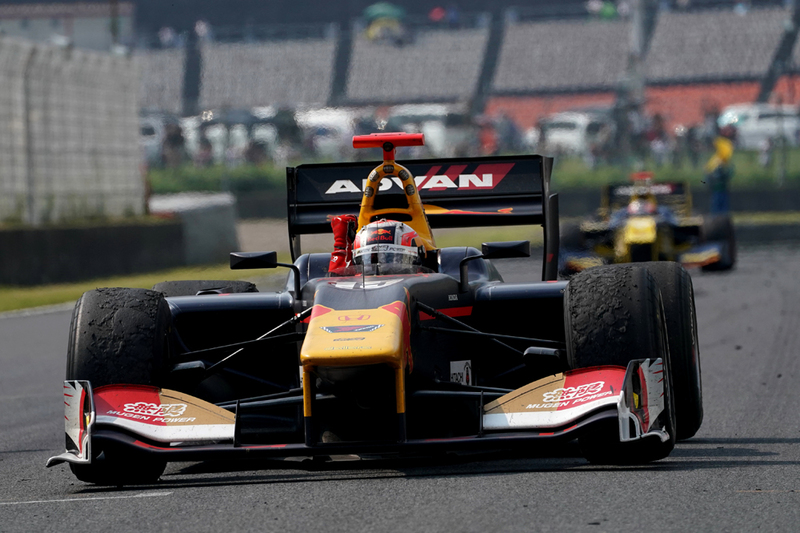 2nd grid starter Yuji Kunimoto, the 2016 champion, dropped down one spot to 3rd to begin the race, followed by Kamui Kobayashi in 4th, Yuhi Sekiguchi in 5th, and Kazuki Nakajima in 6th. Felix Rosenqvist headed to the pit on lap 4 to change to soft spec tires. There was a mandatory tire change for this race, so Rosenqvist did not need to pit again unless he required more fuel or his soft tires didn’t last. Jann Mardenborough passed Kamui on lap 8 to move up into 5th. At this juncture in the race, it was front running Nojiri with less than a 1 second leave over Gasly and Sekiguchi, who had moved up into 3rd after passing Kunimoto. Sekiguchi went to the pit on lap 11 to change again to soft tires. So his teammate Jann Mardenborough was now in 3rd. Koudai Tsukakoshi, who began in 19th, put on quite a passing extravaganza. At the lap 14 mark in the race, he had moved all the way up into 5th place. Then he passed Kamui on lap 15 to take over 4th. Kamui pitted on lap 18 to change to soft spec tires and get a splash of gas. He reentered the track just ahead of Nick Cassidy. Then on lap 21, Cassidy crashed into the tire barriers to bring out the yellow flag. This unfortunately ended the New Zealander’s day. During lap 24, Gasly went to the pit. His short pit time of 12.4 sec. would prove to be the difference at the end of the day. 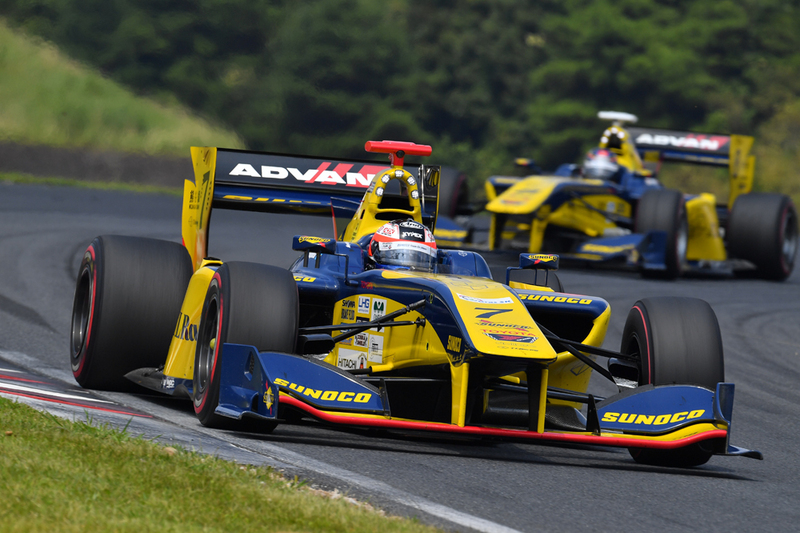 Nojiri continued his lead, but still needed to change tires. So on paper, it was Gasly’s race to lose, as he was running in 6th, but the cars in front of him still needed to take care of the mandatory tire change. Behind Gasly was Felix Rosenqvist, who had already pitted on lap 4. But the question still remained whether he had enough fuel, and also if the soft tires would last until the end of the 250 km (54 lap) race. 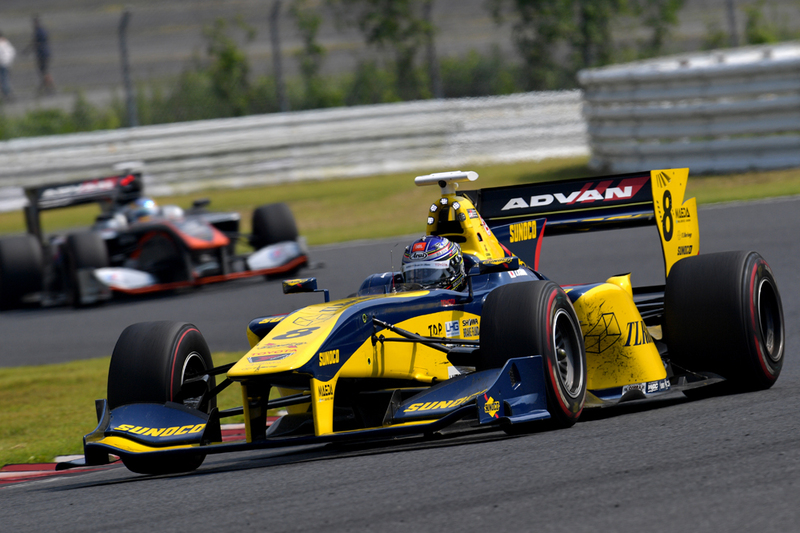 Nojiri pitted on lap 39, but it took his team far too long to add fuel, so he lost valuable time. Shortly after, Nojiri crashed into the back of Kamui’s car, which resulted in the front nose of Nojiri’s machine being torn off. He would need to pit to have a new nose put on, ending his hopes for a victory. 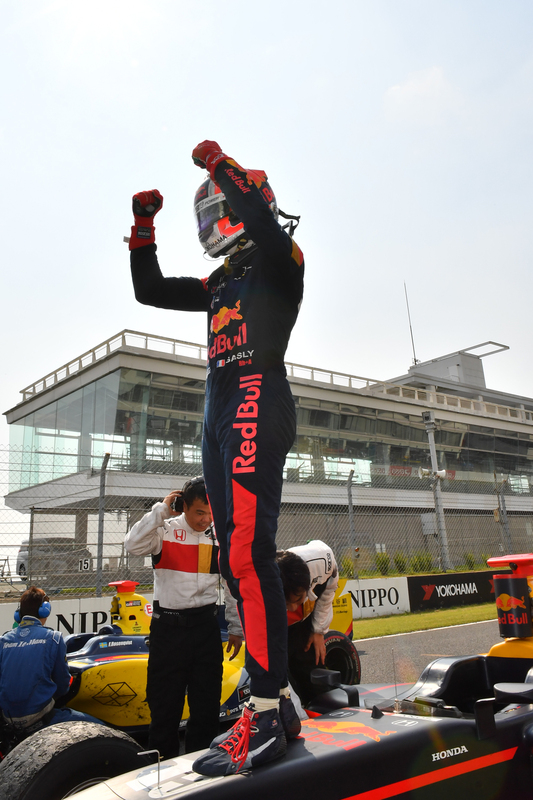 In the end, it was Red Bull Junior Pierre Gasly who took the checkered—his 2nd consecutive Super Formula victory. 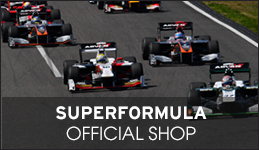 Felix Rosenqvist took 2nd, and Rosenqvist’s teammate Kazuya Oshima captured 3rd for his first podium this season. Both Rosenqvist and Gasly still have a very good chance to win the season championship with 2 Rounds (3 races) remaining in the 2017 season. 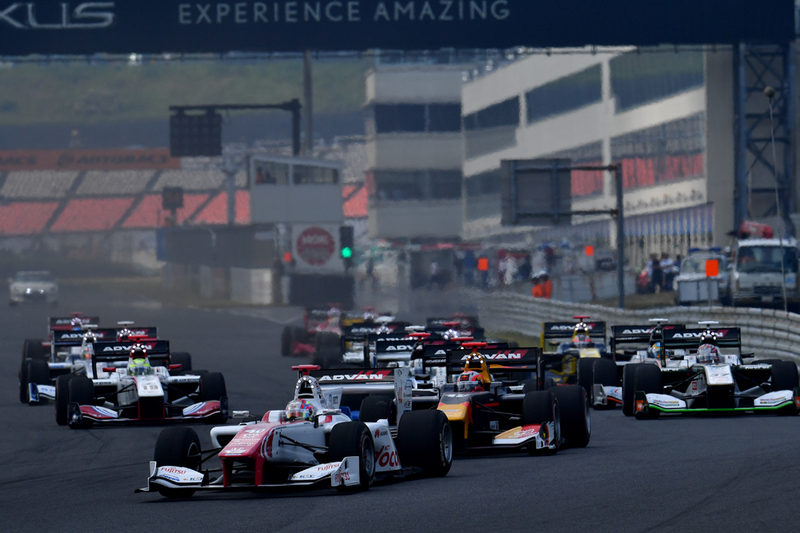 Hiroaki Ishiura finished the race in 4th place, Kunimoto in 5th, Kazuki Nakajima in 6th, Kamui Kobayashi in 7th, and Jann Mardenborough in 8th.